You are currently browsing the tag archive for the ‘First Baptist Church’ tag. 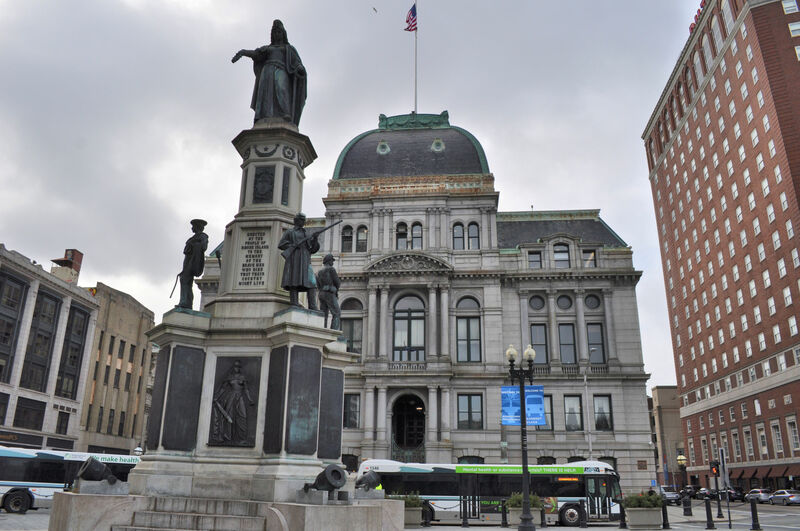 Soldiers and Sailors Monument in front of Providence City Hall, with the Biltmore in red brick next to it. 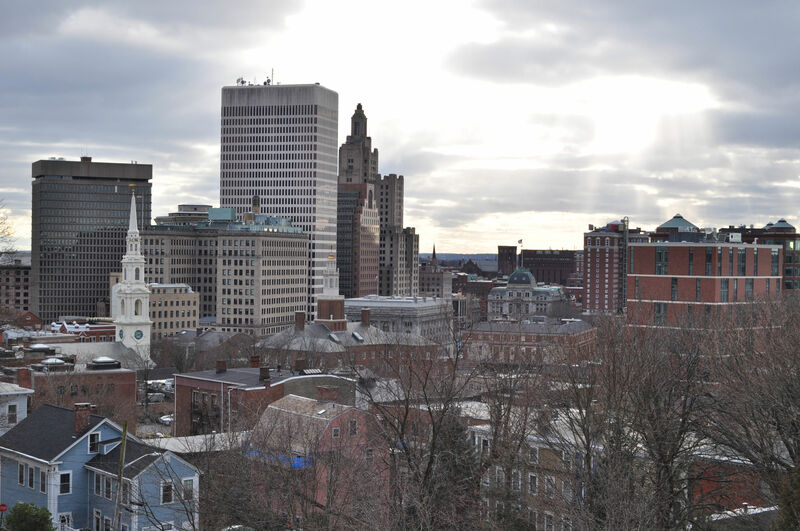 With the fabulous Providence Biltmore as a home base, it made sense that one day’s exploration should be just out the front door. As it had been all week, it was very cold and windy. Despite wind chills in the teens, we bundled up and left the hotel lobby to start walking and see where our feet would take us. They took us to some wonderful sights. 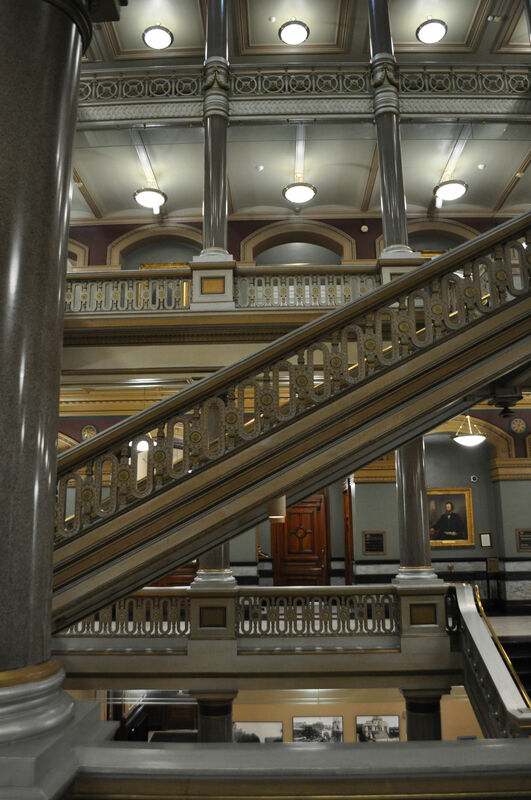 Right next door is the Providence City Hall, a beautiful building on the outside, and simply gorgeous on the inside. 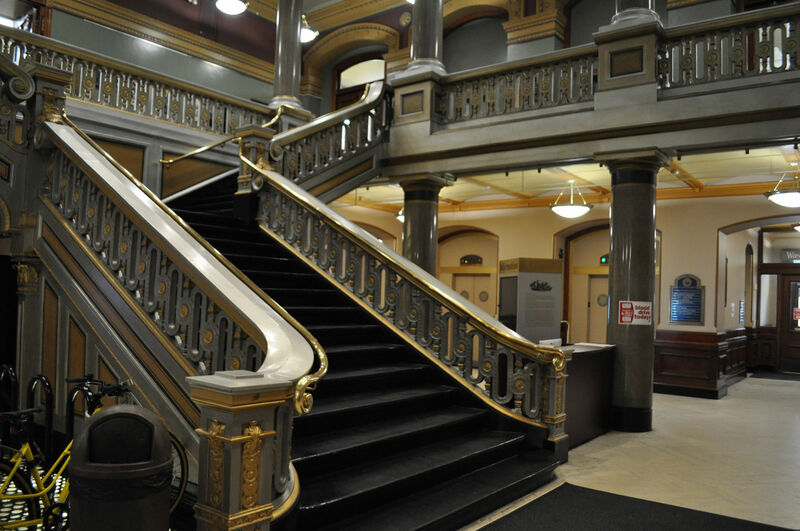 It was built in the 1870s, and continues in use today as the City Hall. The five-story building is built of iron and brick, and at the time of construction employed some fascinating technology. There was a water-powered elevator that could carry 50 people, but is no longer in operation. Prior to electricity, a central control clock was used, wound up each morning by the janitor like a grandfather clock. The clock sent a signal to all the other clocks in the building. The City Messenger’s office was equipped with bells and speaking tubes that connected to all the other offices in the building. Remnants of these features are still visible today. Stairs from the main floor up into the heart of the building. Clock on the fifth floor. Old elevators still gorgeous, but no longer in use. We crossed the street to gaze at a few monuments. The first was the Soldiers and Sailors Monument, shown in the image at the top of this post. 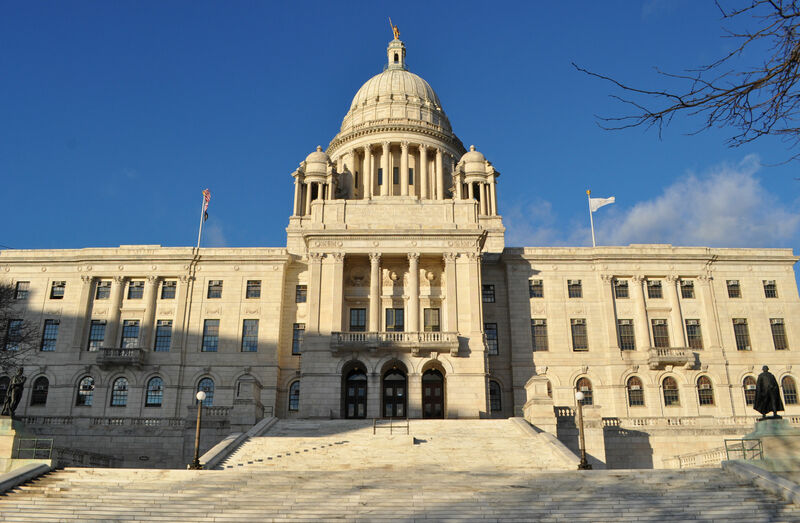 Dedicated in 1871, the 40-foot monument recognizes 1,727 Rhode Islanders that died during the Civil War. The figure at the top represents America, and the four smaller figures represent four branches of the military. The bronze reliefs are allegorical representations of War, Victory, Peace, and Freedom. A short walk away is The Hiker, installed in 1911 to commemorate those who fought in Spain, the Philippines, and China from 1898-1902. 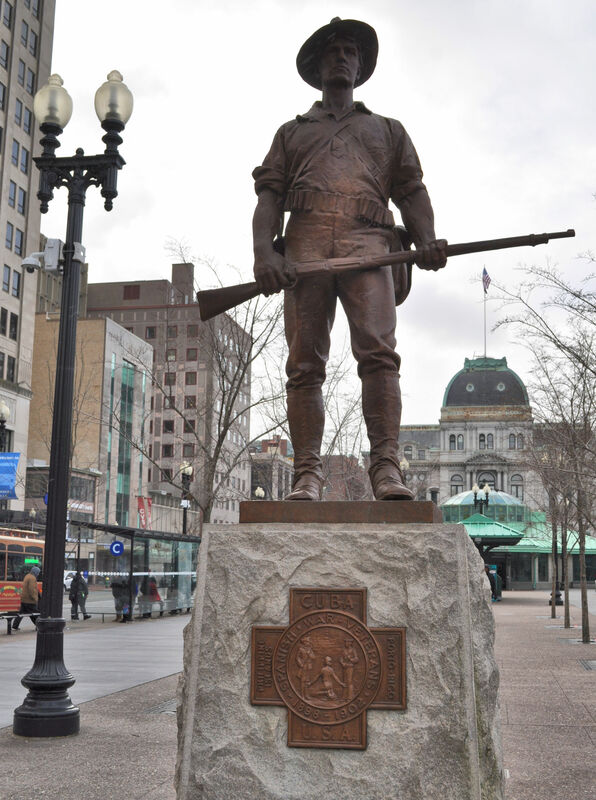 It is a replica of the original The Hiker, installed at the University of Minnesota in 1906. The name comes from a term soldiers in both the Spanish–American War and the Philippine–American War gave themselves. Providence has a lot of hills, and since we began in a valley, it was inevitable that we would eventually hit an incline. We began walking uphill and a lovely white church caught our attention. 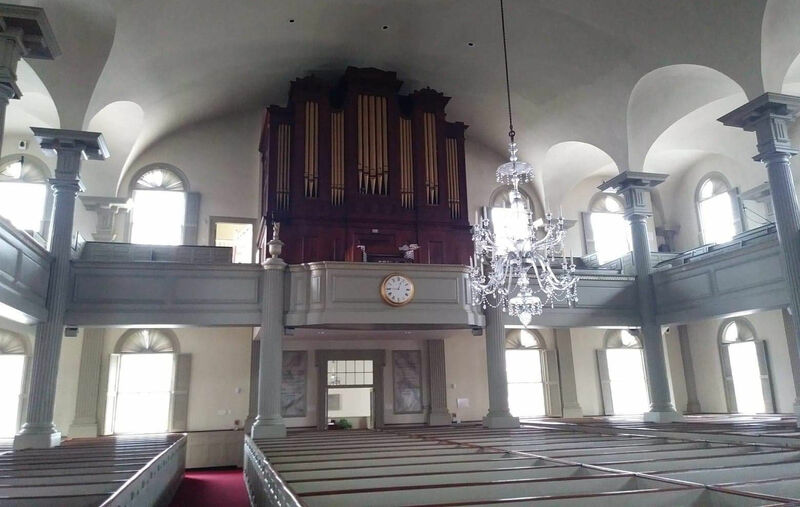 It is the oldest Baptist church in America, aptly named the First Baptist Church, and holds a central role in the founding of the state of Rhode Island. 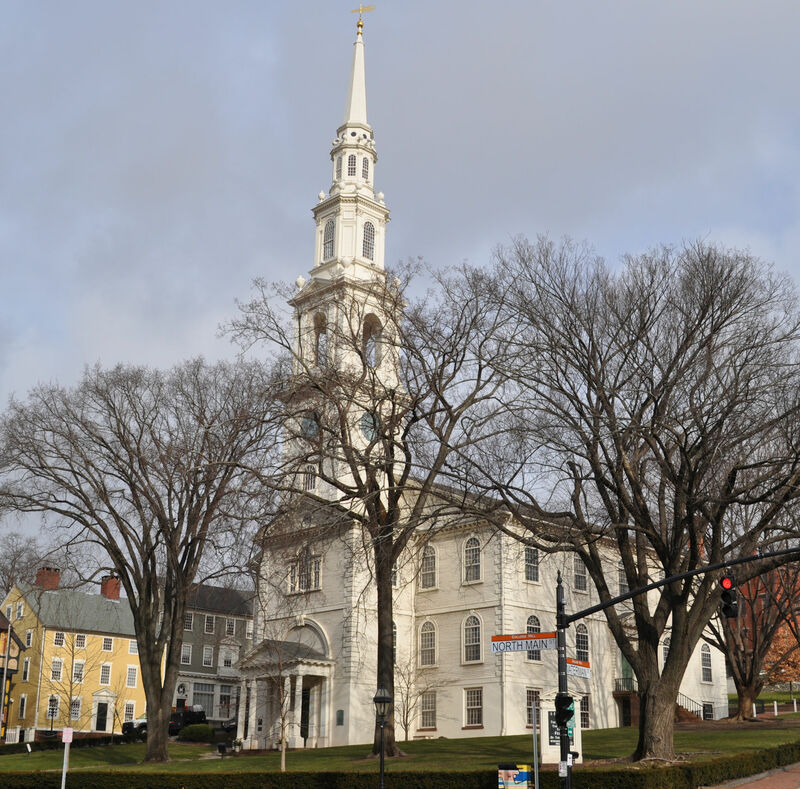 The church was founded by Roger Williams in 1638. 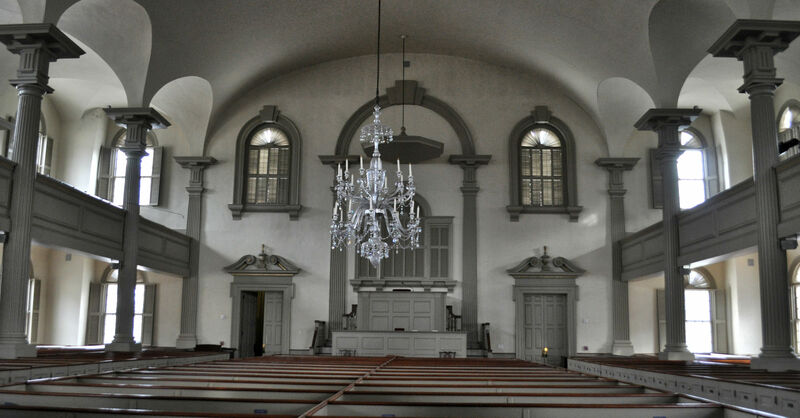 The present building was erected in 1774-5. Roger Williams was a Puritan who left England to escape religious and political persecution. He did not come to America in the first wave however, but a few years later in 1631, and brought non-conformist ideas of what the colonies should be all about. Williams was adamant about separation of church and state, and insisted that the local church totally repudiate its ties with the Church of England. He also declared it a “solemn public lie” that the King of England had the right to grant land to colonizers without first buying it from the Indians. The ideas challenged the legality of land uses at that time and stirred up political and religious unrest, and threatened to upset the fragile economy. All this had been set up before Williams even got there, and his loudly proclaimed contrary ideas were a major disruption. By 1635 the local authorities had had enough and tried and convicted Williams. As punishment he was to be banished to England. Instead, Williams hiked through the snow from Salem to Narragansett Bay and lived on the hospitality of the Wampanoag Indians. The following spring he purchased a piece of land from the Indians, and with some friends from Salem, started a community. He named it Providence, after the providence God had shown him. His community was based entirely on religious freedom, welcoming all to come and worship in their own way. 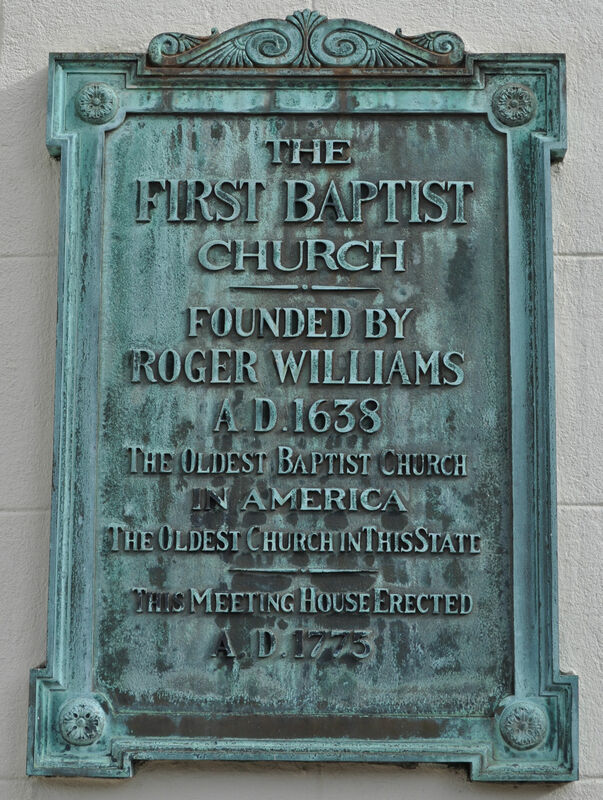 Williams became a Baptist and began the Baptist Church in Providence, and was its first pastor. First Baptist Church in Providence. 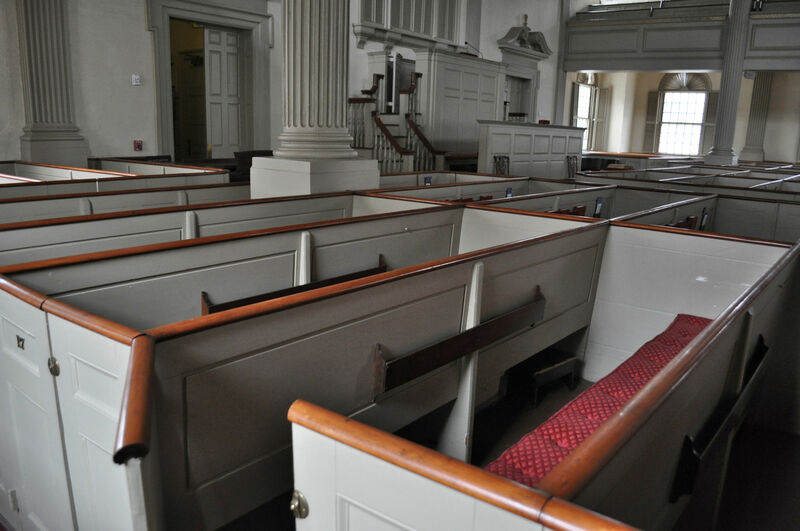 The oldest Baptist Church in the country. Eye-catching buildings line the street beside the First Baptist Church. That colourful one in the center is the Providence Art Club. Interior of the church. There is stained glass behind that wall, only viewable from the outside. Not sure what that’s all about. Will guessed it could have been to maintain the humility and simplicity espoused by Roger Williams, who never would have approved an extravagance like coloured glass in his lifetime. In the early days, patrons would rent their box, and would have a say regarding who was allowed to sit in it. We left the church and started uphill once more, coming across Brown University, another institution woven into the fabric of Providence’s early days. Dr. James Manning had been dispatched from Philadelphia to oversee some reforms in the Baptist church in the area, to include starting a Baptist college. (Dr. Manning was pastor when the church in the photos above was built) Originally called Rhode Island College, Manning was its first President. When the school charter was approved in 1764 it was the 7th college in America. 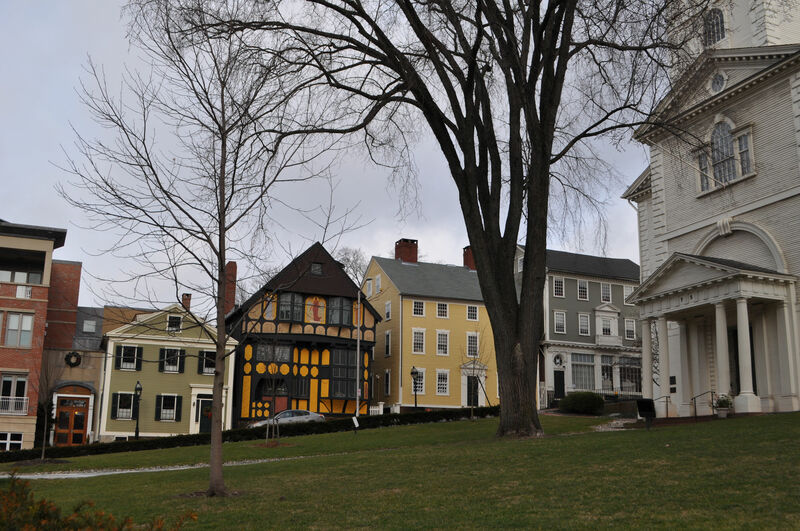 Now called Brown University, it remains a premier American University. 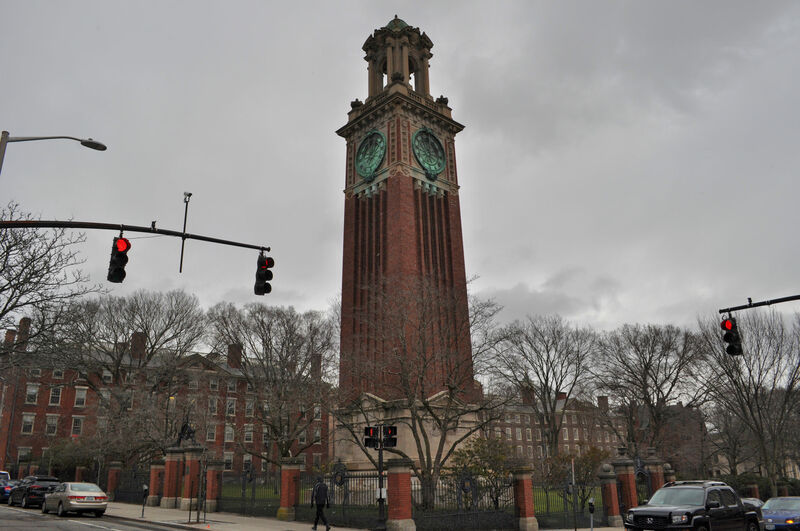 Clock tower on a cold Winter’s day at Brown University. On the grounds of Brown University. The State House dominates the horizon here. The State House looked so impressive from a distance that I really wanted to go there. Will double-checked with me about that, since it was so cold I could barely feel my face or hands. Like those early settlers here, I didn’t let a nasty winter day get me down. Onward ho! At the bottom of the hill we stopped in the beautiful train station to chat and get warm before continuing the long walk to the State House. As my reward for tenacity, the clouds parted and the sun began to shine. It wasn’t any warmer, but it was prettier. 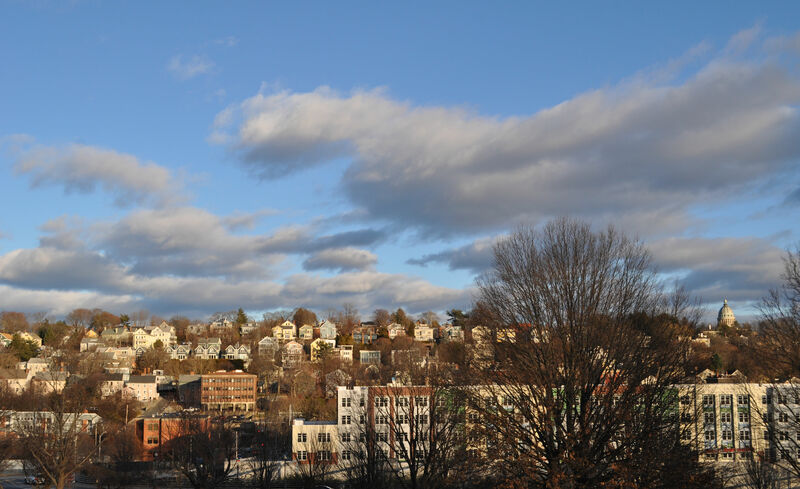 A lovely New England neighborhood on a hill. Gettysburg Gun with charge in the muzzle. 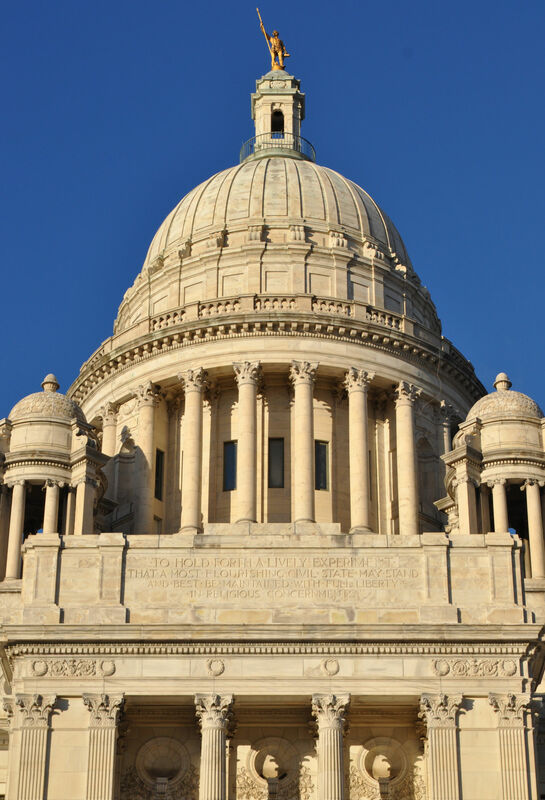 Atop the State House stands the Independent Man, deemed to represent the character of a Rhode Islander. The statue of a muscular man clad in a loincloth and carrying a spear is made of gold and bronze, and was melted down from a donated statue. Previously a statue of Simon Bolivar in Central Park that the city of New York considered an eyesore, the gift from Venezuela was sacrificed. 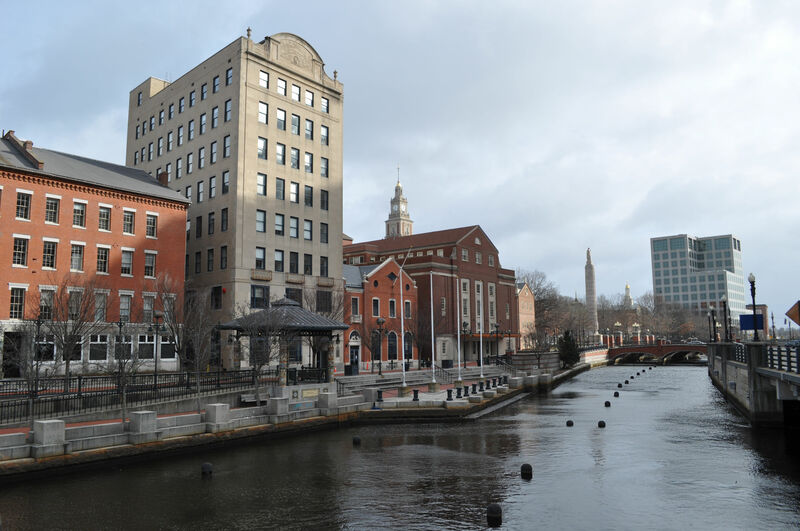 The Independent Man was placed atop the cupola in 1899, and has survived lightning strikes and many many Rhode Island winter storms. To get into the State House we had to have ID checked and pass through a metal detector. 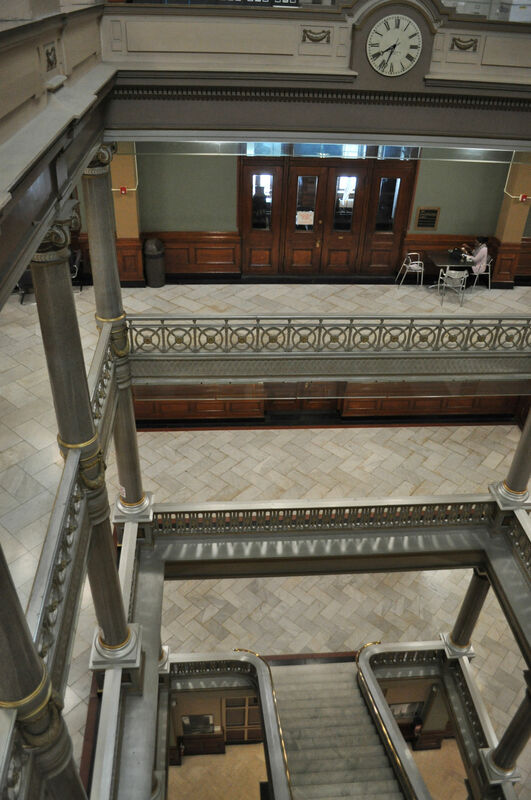 Once inside, I was doubly impressed by the grandeur here than I had been by City Hall. 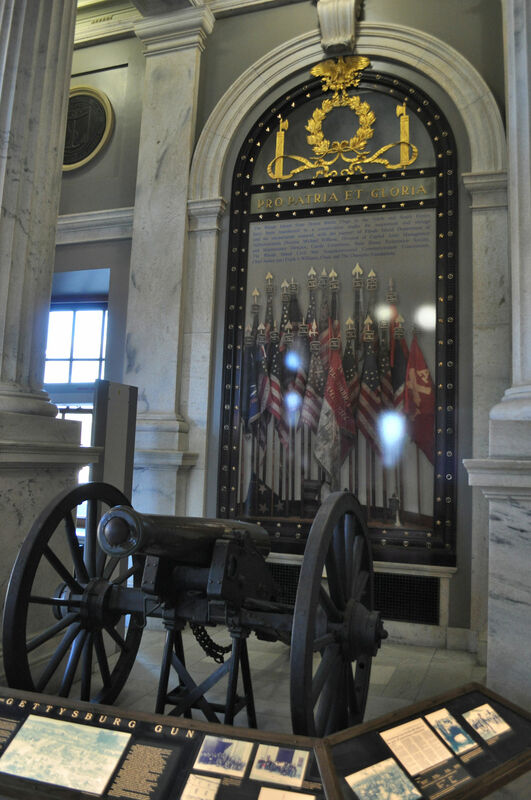 The foyer holds a Civil War gun that was last fired on the final day of the Battle of Gettysburg in 1863. The gun was struck by a Confederate shell, damaging the muzzle of the gun and killing two soldiers. An attempt was made to reload the gun. Try as they might, members of the Rhode Island Light Artillery could not force the charge into the gun. When another shell hit and blew a wheel off, they gave up. The gun was allowed to cool, sealing the charge in place. The House of Representatives were going into session soon, and the foyer was packed with people: participants, students, tourists, and the media with their cameras and lights. Will and I ducked the crowd into a quiet hallway and found the original Charter for the state of Rhode Island! 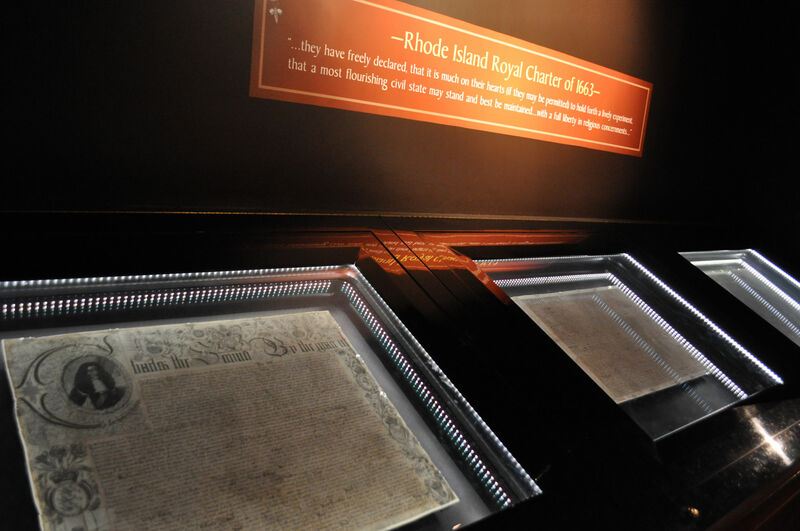 The original charter from the King of England granting religious and political rights to the people of Rhode Island. 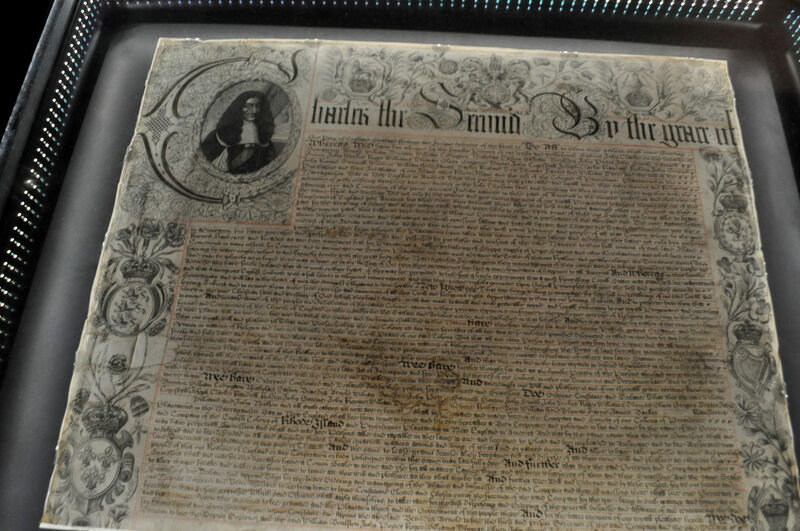 In the Royal Charter Museum, three pages that make up the original document are held. 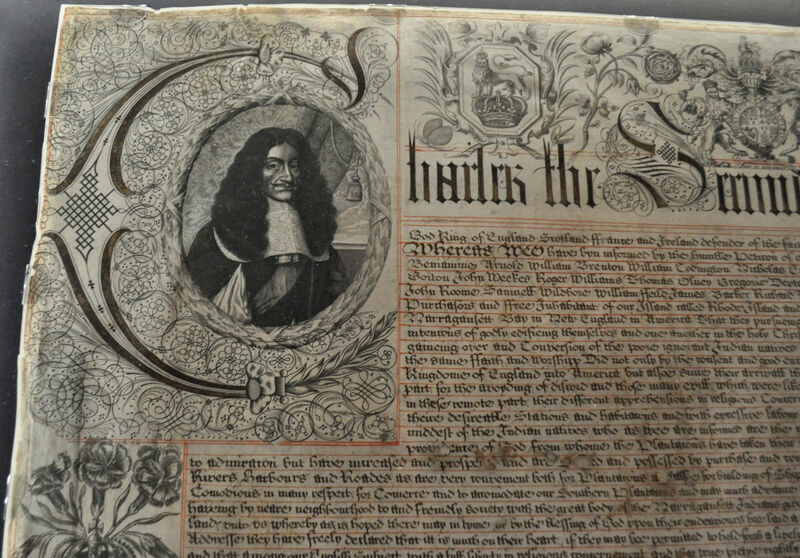 In the 1663 document, King Charles II allowed settlers in Rhode Island to govern their own colony and guaranteed their individual freedom of religion. 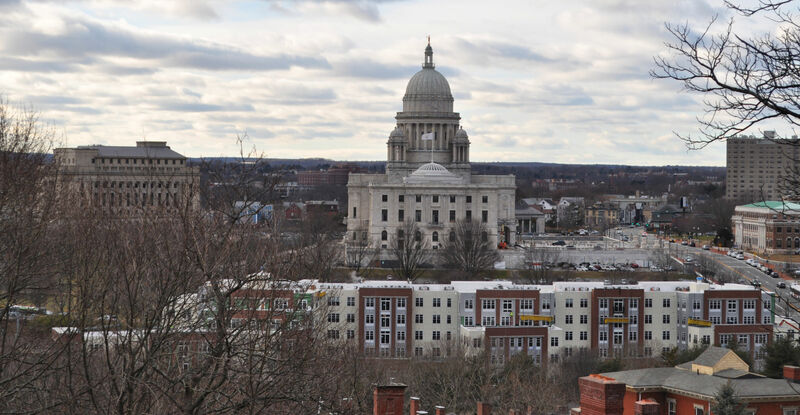 It was the kind of action Roger Williams dreamed of, and was in fact the first time in history that a monarch had agreed to this level of religious freedom. The event is remarkable, and the documents themselves were extraordinary works of art with such elaborate calligraphy that I could not read them. The first page with calligraphy and illustration. Close up of the magnificent ink work. 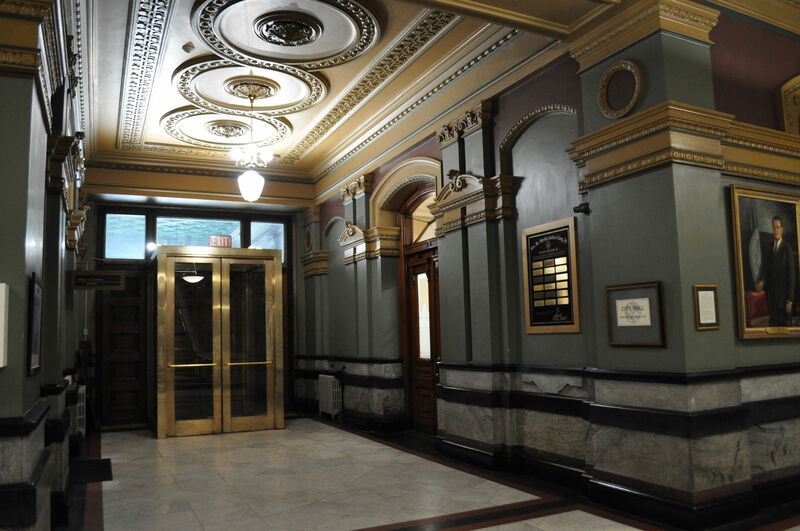 We then wandered the halls of the majestic building. We had been warned by the docent in the gift shop that we would hear bells notifying Representatives to take their seat. She told us the bells would continue till the gavel was sounded. When the bell rang as predicted, it was very loud and sounded like the ring in a high school to notify students to head to their next class. Unlike high school bells, this one continued to ring. I thought the children we call politicians only pulled their stunts in Washington, D.C. Oh no, their lack of discipline, lack of respect for their office, lack of concern for the pressures that the rest of the world is forced to work under, became quickly evident here at the state level too. The bells rang and rang. Will and I sat in the gallery and watched. Hardly anyone acted as though they had noticed the incessant clanging. People chatted happily and unconcernedly. Pages were summoned and dispatched, returning with requested cans of soda. 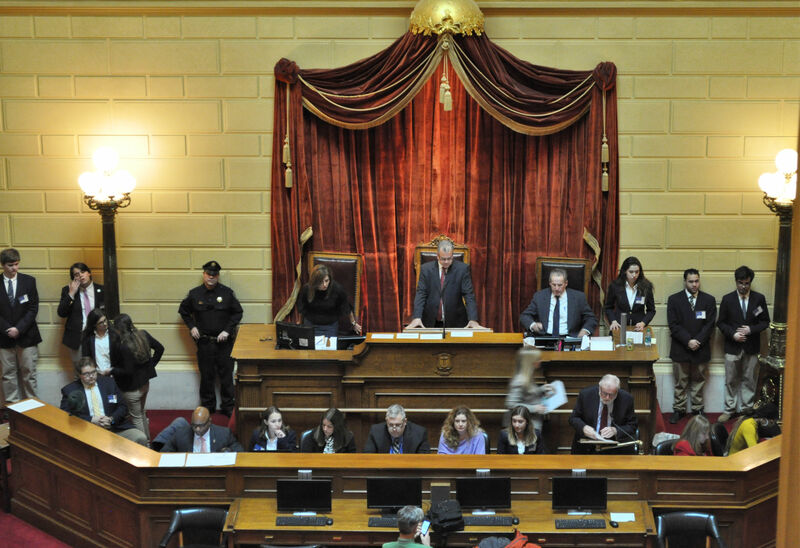 About 5% of Representatives took their seats, and I seriously wish I could name the ones who were seated, logged in to their desk computers, notes in a neat pile, and patiently waiting. Those people deserve your votes. And rang. And rang. Every few minutes, another elected official wandered in, chatted awhile, set down some papers and wandered off. The bells kept ringing. I timed them: for TWELVE MINUTES before finally the Speaker banged the gavel. It was ridiculous. These people are treating the job with the gravity of preschoolers who have been told it’s time to move from story mats to the play bins. It felt even more insulting since the federal government is shut down. If this is how they do it in D.C., well no wonder nothing gets done. 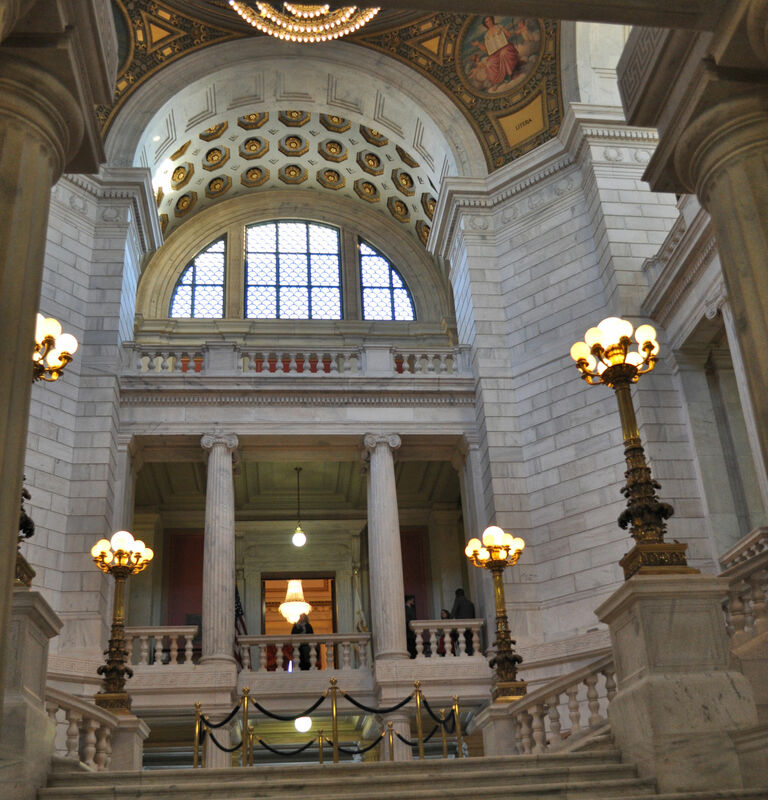 Entrance into the State House (I took this photo as we were leaving, when everyone was seated quietly in the House). 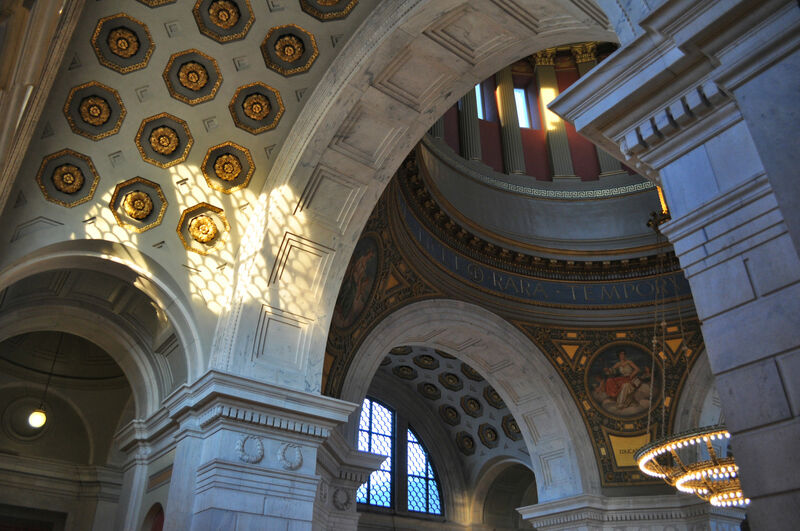 Sunlight adds depth and warmth to the arches and domes. 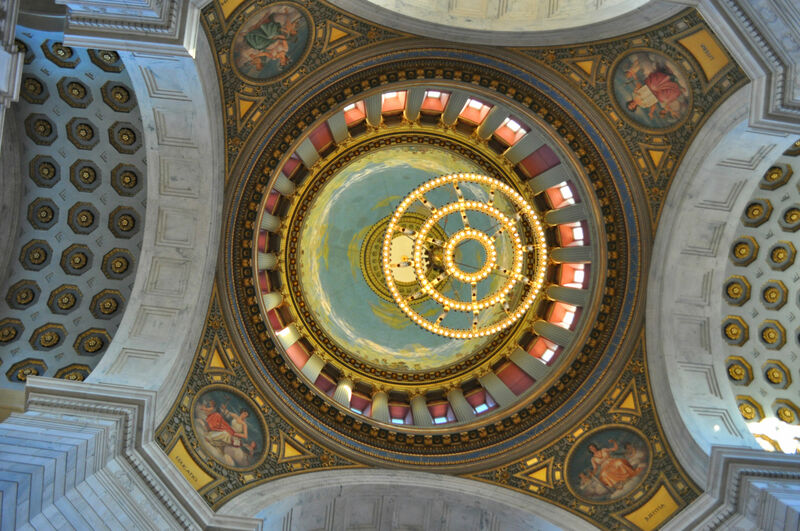 Looking directly up into the dome. 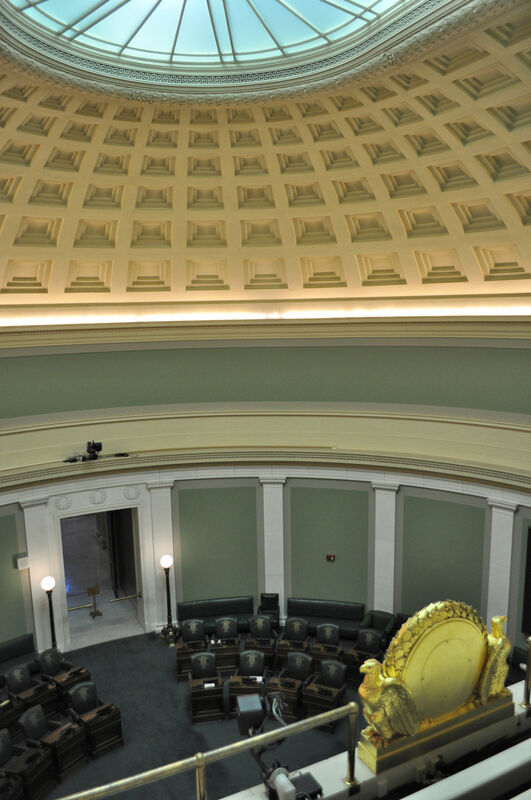 The much smaller Senate room was quiet. We sat in the gallery and listened to the bell calling Representatives to work for a full 12 minutes. …and FINALLY they went to work. 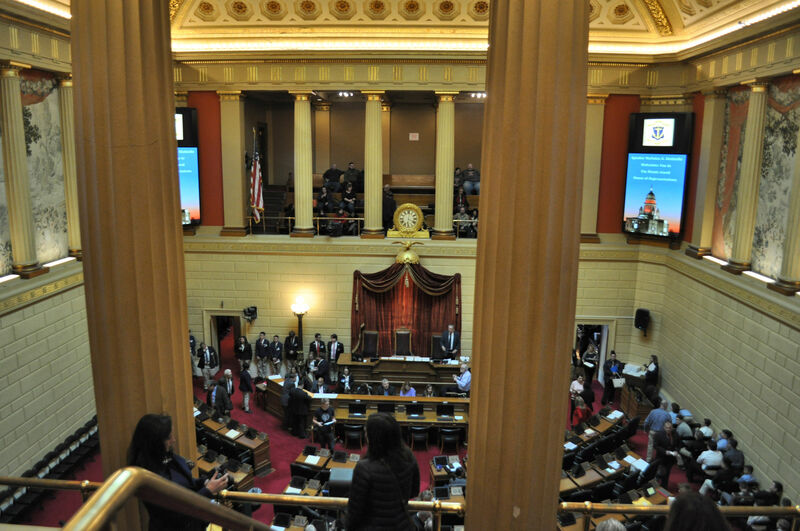 Please please do not infer that I mean to disparage only Rhode Island politicians. What I believe we witnessed is a culture that must certainly have its roots in D.C. My best guess is that every single state in the Union takes the job of politician equally (un)seriously. I was disgusted. But it had been a beautiful day and I anticipated more! Outside the sun was dropping and we saw a pretty sunset. I charged Will with finding cake. The day before had been my birthday and I had not eaten any cake for my birthday, which was a grave oversight. I demanded cupcakes. Will said he knew the perfect place. 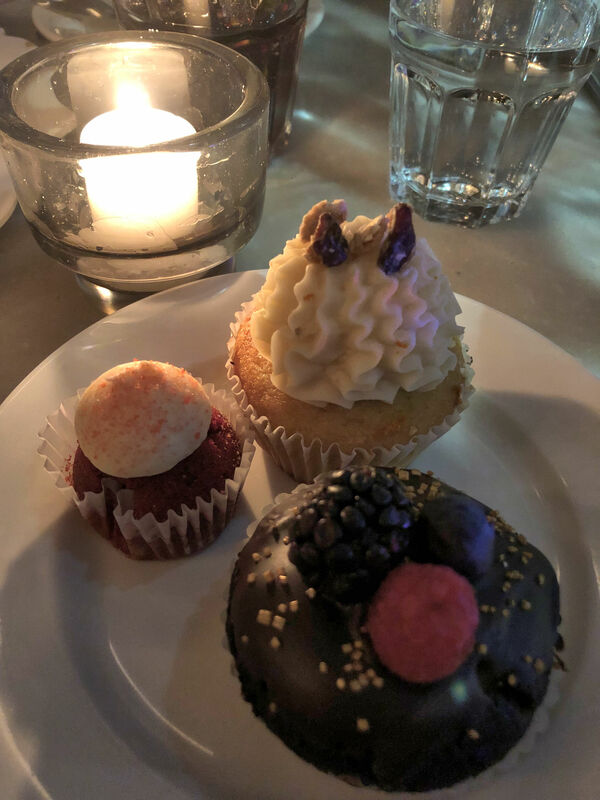 We walked back to the Biltmore to get the car and went off to have many many cupcakes at Duck & Bunny. 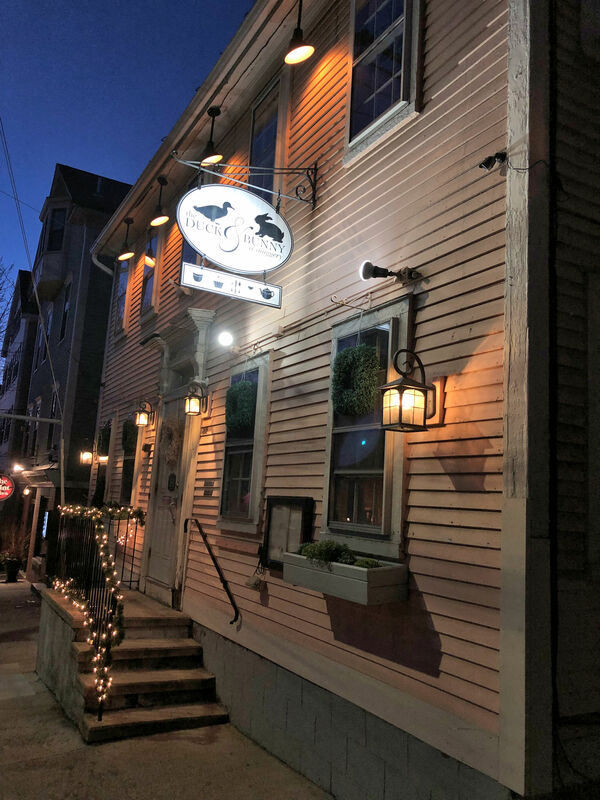 This restaurant calls itself “a snuggery,” which their website insists is a word. It is delightful inside, and the tables are scattered throughout the rooms of the former house. We sat next to the fireplace, that was filled with burning candles instead of of logs. It was an incredibly fun day, the birthday cupcakes were extraordinary, and it still wasn’t over! Next we walked to The Trinity Repertory Company to see a play, which was so good I already did a blog post on it because I was excited to tell you! Three of the six cupcakes I ate from their filled pastry case. 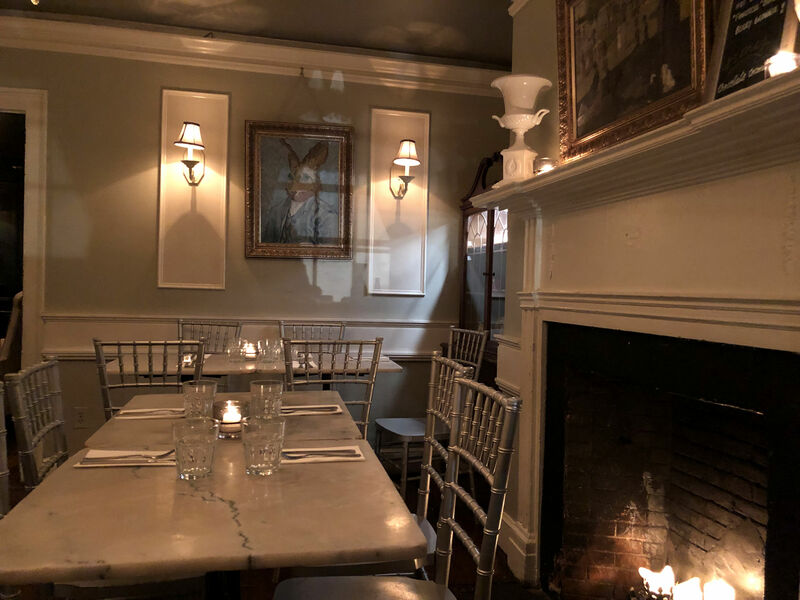 Inside this classy restaurant is artwork that seems familiar at first, but is distinctly rabbit- and duck- themed.